While I'm writing up this review, I'm on the last drop of my 5th little bottle of these Skincode Exclusive - Cellular Power Concentrate Ampoules*. Phew, long name. Considering the fact that I received these 6 little serums/concentrate just around the end of November, this is an indication of how much I enjoy using it. In order to test this out, I went all in and stopped using my other facial serums, with the exception of some Naruko Rose usages where my skin is extra dry. 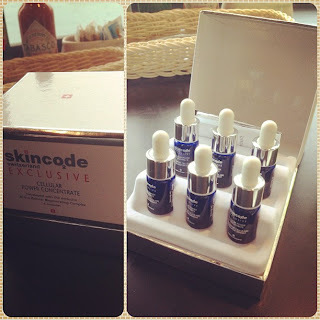 Skincode has a Swiss origin and this serum is made in Switzerland. Skincode makes two line, the primary one is called 'Essentials', while the higher grade line is 'Exclusive' with patent ingredients to actively regenerate cells. This set of serums has no artificial colourings, preservatives nor fragrance. I love how it came in little ampoule bottles; very cute and keep the content fresh. The product itself is a slightly thick water gel texture, has a barely noticeable hint of alcohol/fragrance. Absorbed in the skin in seconds, I notice improvement in hydration, size of my pores (on the cheeks) and fine expression lines (I tend to laugh too much). Visit http://www.skincode.com.hk/ and know more about the brand! Uh oh, down to the last drop. Better get some more. THanks for the review. I need intense treatment once in while too. And I do NOT have young skin. Of course~ Lines (wrinkles) cannot limit our laughs!